I need help! 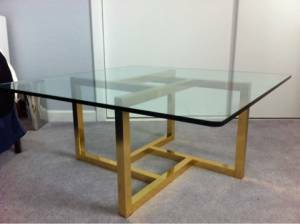 I've found this brass/glass coffee table that I think I might like for only $40, but I just can't decide. 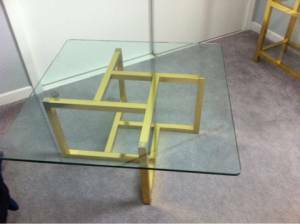 I've had my eye on brass/glass coffee table combos for awhile. Honest thoughts are appreciated!!! I like it! Wonder if you could kind of sand and poly-eurothane the wood? Kinda sharpen it up a bit ya know. It's not wood, it's gold (just hard to tell on a low quality craigslist pic!). I like the brass a lot and def see where you're going by the inspiration pix. My only concern is if its top heavy. I would want to see how secure the glass is on the base. I've been looking for a brass coffee/cocktail table too. I want one with a marble top but I'm having a hard time finding a large square one. They all seem to be narrow or too much $$$. Let me know if you see something!